Producers that use our loops and samples are always asking ”How do I import Apple Loops in Garageband or Logic?”, so we put together this simple tutorial to show you how it’s done. Importing and indexing our Apple loops into Garageband is really, very easy. In a nutshell you simply drag and drop the apple loops from a ‘Finder’ window directly into your loop browser while Garageband or Logic is open. 1 – Open a Finder window and navigate to the folder on your hard drive that contains the apple loops. Make sure that you have unzipped the apple loops from the zip file first. For older versions of Garageband, you need to make sure that you are viewing the actual .aiff files and not just the folders. You cannot drag folders into the older Garageband loop browser, only files. 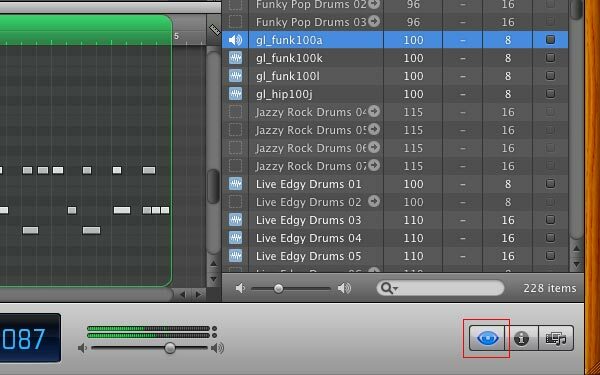 2 – Open Garageband, expand the loop browser if required. To open the loop browser, click the Loop Browser button (with the eye icon) in the control bar. Next go to the Finder window and select the apple loops (.aiff files) that you want to index and simply drag and drop them directly into the open loop browser. 3 – Depending on the amount of loops that you are importing, it could take some time, so go and make some coffee while you wait. The fast your machine ,the faster the loops will get indexed. If you’re good at keeping your disk defragmented you’ll also see a benefit in speed during massive file dumps. 4 – When the apple loops have finished indexing go to the Preferences > General tab and uncheck the “Filter for more relevant results” option as this will increase the number of apple loops that you’ll be able to see. You might want to try doing this before indexing the loops. If you have purchased our Max Producer Pack or simply have lots of collections of apple loops it’s going to take a long time to navigate to all the sub folders that contain your files. The best thing to do in this instance is to dump all of your apple loops into one large folder and then use Finder to search only for .aiff files within that folder. You can then select the search results and drag and drop them into the Garageband loop browser. It will take a long time to index the files but you’ll have saved a lot of time manually digging down to sub folders to find your apple loops. Just be careful what you delete. Make sure you only delete files that failed to index and always have a backup of anything you intend to delete.